COLLEGE STATION – Nothing beats good brisket and Texas barbecue, but smoking brisket on a barbecue pit can be a daunting task for the novice. “I love barbecuing in general, but the brisket is a very intimidating cut of beef,” said David Nelson of Austin, who attended Camp Brisket recently at Texas A&M University in College Station. The program attracted more than 60 attendees who entered a lottery system and won a ticket to the two-day event that organizers say teaches everything you would want to know and more about how to cook good barbecue brisket. Camp Brisket is a partnership between Foodways Texas and the meat science section of the department of animal science at Texas A&M. 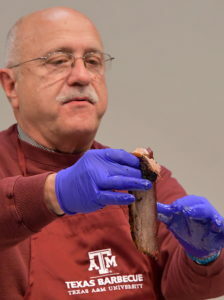 The program was led by Dr. Jeff Savell, university distinguished professor and E.M. “Manny” Rosenthal, chairholder in the department of animal science; Dr. Davey Griffin, Texas A&M AgriLife Extension Service meat specialist; and Ray Riley, manager of the Rosenthal Meat Center, all at Texas A&M in College Station. Aaron Franklin of Franklin Barbecue in Austin was part of the all-star lineup of program speakers that led a brisket trimming demonstration. 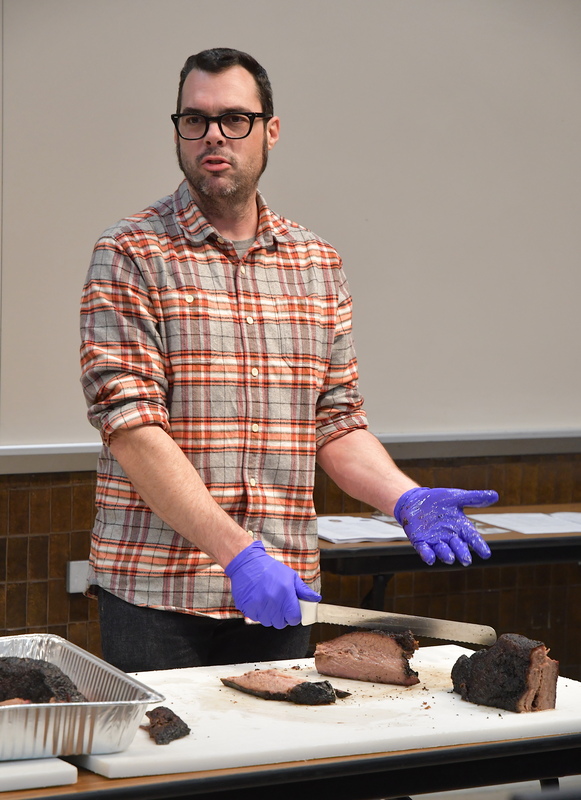 Jess Pryles, Austin-based cook and author, led a discussion on comparing restaurant and competition style brisket. Homer Robertson, world champion chuck wagon cook, provided a chuck wagon breakfast to attendees. Other experts on hand were Bill Dumas of Stiles Switch Barbecue; John Brotherton of Brotherton’s Black Iron Barbecue; Joe Riscky of Joe Riscky’s Barbeque; Kerry Bexley and Tootsie Tomanetz of Snow’s BBQ; Wayne Mueller of Louie Mueller Barbecue; Russell Roegels of Roegels Barbecue Co.; Tom Abney, Southside Market and Barbeque; Kevin Kolman, Weber-Stephen Products; and Ryan Zboril of Pitt’s and Spitt’s. Topics covered all aspects of barbecue brisket, which spanned understanding brisket anatomy, trimming briskets, seasoning, cooking/smoking and proper slicing techniques. Participants took part in tasting demonstrations featuring different grades of briskets smoked with traditionally used Texas woods. There was also discussion on whether to wrap or not wrap, during cooking. Franklin and Savell teamed to also give camp attendees insight as to how to properly slice a cooked brisket. For more information, visit https://bbq.tamu.edu.